After a resoundingly positive response to our last ancient offering, the Mithradates VI AV gold stater, we are happy to bring you another exciting Mint State ancient coin. Before we get into the details about the coin, we’d like to explain a few things about how ancient coins are found, how they come to market, and how these factors influence prices and perceptions of rarity. How does a coin from over 2,000 years ago end up in your hand, in perfect uncirculated Mint State (MS) condition? From the very birth of coinage to the present, coins have been traded, hoarded, collected, or buried underground in a myriad of ways. Many coins could have been buried or lost in large groups (this is referred to as a hoard). Other single coins have been discovered underground by metal detectors across Europe and the Mediterranean, some even as far as India! Coin collecting is considered a ‘hobby of Kings,’ and as such, many high-grade specimens are handed down over the ages or kept in royal collections. In a few rare instances, hoards of high quality coins are discovered and the market becomes ecstatic. How do these factors influence the price performance and rarity of a given piece? When a hoard of truly quality coins comes to market, such as the current offer, collectors and investors compete for the highest graded coins, and we see international prices rise, as the total number of coins is not known. For the current offering, we were able to purchase a remarkable (32) Mint State pieces! After the dust settled, we saw the total number of coins available on the market made an interesting coin even more interesting. We have seen auction prices for this coin realize over $2,000 in the last two years, and many of those results were for ungraded coins. $1,765* - Our cost including shipping, handling and insurance. 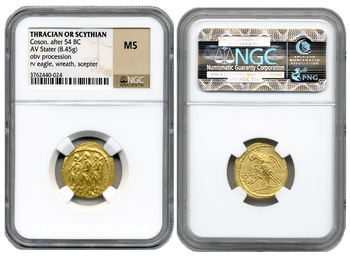 All coins are professionally graded Mint State (MS) by the Numismatic Guaranty Corporation (NGC). Struck over 2,000 years ago of 9 grams of nearly pure gold, the obverse features three consuls in procession, while the reverse features an eagle holding a wreath. Ancient history scholars have put forth two versions of the origin of the Coson Stater. The first version purports that Brutus, the assassin who betrayed Julius Caesar, struck the coins using gold treasure provided by the Roman Senate. In this version, the staters were used to pay troops provided by the Thracian King, Coson, to defend the Republic from troops loyal to Julius Caesar. The second version says these staters were simply imitating a popular Roman silver denarius of the time, struck under Brutus. While the precise origin of the Coson Stater remains a mystery, perhaps a greater mystery is how any coin of this age has maintained pristine uncirculated condition through the ages! The Coson Stater is a key coin for every ancient portfolio. Call 800-831-0007, or send me an email to add one to yours today!